While we were on Ko Chang (which is Thai for Elephant Island), Tim and I visited an elephant camp located in the interior jungle of the island. 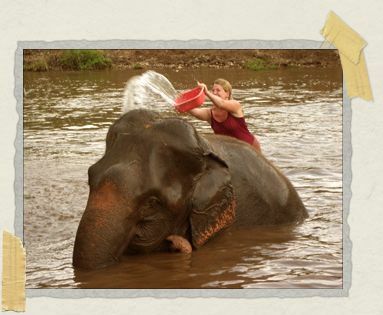 We both wanted to ride an elephant and (much to the amusement of our friend Klaus who was traveling with us at the time) bathe one too, and there just happened to be a place that allowed you to do those things on Ko Chang. Before booking a tour with them, though, we wanted to visit the camp to get a feel for it's "feng shui." It's funny looking back on that visit. We both remember thinking how it just didn't feel right at the camp. We couldn't really put our finger on why…the elephants were chained when they weren't working with tourists…and the mahouts (elephant handlers) were a bit too enthusiastic with their hook, hitting their elephant when it seemed unnecessary…but these were normal things for an elephant camp. They weren't anything that should have drawn our attention. But still, something didn't sit right with us, and so we opted against riding an elephant at that camp. That evening we did a bit of research online to see if there were any other camps on Ko Chang that were nicer to their elephants. What we found surprised us: it seemed that there was no elephant camp that could be described as being nice to their elephant. It's not that we read report after report of abuse…we just didn't read anything along the lines of "…and this camp is particularly known for how well it treats its elephants…"
We were reading for about an hour when we stumbled across a reference to an elephant sanctuary located somewhere in northern Thailand, about an hour away from Chiang Mai. It seemed there was a Thai woman there who had a huge tract of land where she allowed her elephants to roam free, where they could choose their own family groups, where they could go down to a nearby river whenever they wanted a bath, and where people weren't allowed to ride them. It also mentioned how hooks and bamboo sticks weren't allowed to be used by the mahouts against the elephants at this sanctuary. Although we couldn't find much about the sanctuary, what we did read was intriguing if for no other reason then the things the owner promoted at her park seemed to be things that didn't happen at other elephant places. It was interesting stuff, but I have to admit both of us were a bit wary of what we were reading. Was it really bad for people to ride on the backs of elephants? Isn't that what everyone did in Thailand? Was this woman just an extreme animal rights activist or was she for real? I can't say we were able to answer those questions that evening. 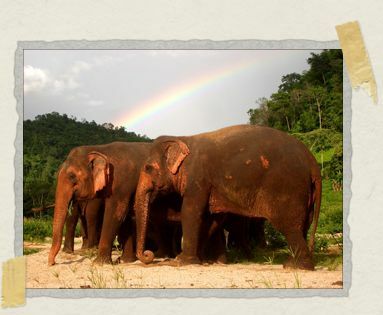 But we read enough to decide that if we were going to have an elephant experience in Thailand, we would only do it at this little-known sanctuary called Elephant Nature Park. "If you're using a brush instead of a bucket, you really have to get your whole body into it. Lean into them and really scrub! They're elephants, they like to feel like they're really getting clean." It was a bright Thailand afternoon and Tim and I were walking to the nearby Mae Tang River with our tour guide, a wonderful woman named Jodi, and three other visitors to Elephant Nature Park. Jodi was busy giving us instructions on how to properly bathe an elephant, while Tim and I were busy watching the mixture of mahouts, elephants, and dogs accompanying us to the river. "Sometimes at bath time there'll be people, elephants, dogs, and even our two cows in the river. There's no other place in the world like it." As we approached the water the sun was beating on our backs and we noticed several families of elephants already moving into the water. A few elephants paused to take a drink or make a splash, while others sauntered right into the middle of the river before laying down in the cool water. Passing a bucket and brush to each of us, Jodi stayed on shore to take pictures of our first elephant bath. Taking a deep breath, Tim and I plunged into the water to join two elephants fairly close to the shore. "That's Mae Perm and Jokia you're walking towards right now. Remember that Jokia is the blind elephant, so make sure to say her name a few times while you approach so you don't surprise her." For the next ten minutes or so we started to get the hang of splashing Jokia with the bucket and scrubbing Mae Perm with the brush. (It's harder than it looks – my guess is because your brain is constantly sending messages to you saying, "Um, excuse me, do you realize you're standing directly next to an elephant and bathing her? Are we ok with this?") It feels rather strange to be waist deep in the water with elephants all around you. And when you realize what you're doing – that you're actually bathing an elephant – it can all become overwhelmingly wonderful. Standing near the rear end of Mae Perm and washing a bit of dirt of her back, I looked down to see something rather large floating in the water around my waist. A few somethings in fact. "Don't worry. Elephants are vegetarian, so that's really just like a bunch of processed hay." It seemed in addition to our first elephant bath, Tim and I had just experienced our first elephant poo too. "There, look at that. Do you see it? The top of the line here is the trunk…and that round dot there is an ear…well, it's sort of an ear." Tim and I had spent the most magical day at Elephant Nature Park. We had fed the elephants and helped bathe them twice. We had watched them interact in their family groups all throughout the park while we sat on the cozy observation deck. We had seen several of the babies up close wrestling. And we had heard the roars that sound like lions which a baby elephant can make to get her mom's attention. We had spent hours listening to the stories of all the rescued elephants in the park, stories about the abuse in their past and the friendships they have now. We had learned about the horrible breaking ceremony that all Asian elephants are forced to endure when they are babies. And we had seen a National Geographic documentary on the sanctuary and the amazing woman, Lek, who had founded it. We had spent the most magical day at Elephant Nature Park, and now we were sitting in a bar back in Chiang Mai, drinking many beers, and seeing elephant shapes in the water marks that the beer condensation left on the table top. "I think we need to go back. I can't imagine not spending a few more days there." 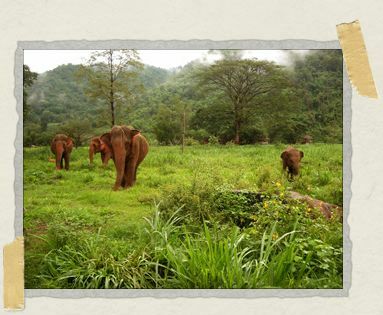 And so we were agreed: we would be going back to Elephant Nature Park for another 3 days and 2 nights. And then we'd be moving along to Malaysia and some well needed beach time. Yes, we were decided. Of course, what we didn't know that evening is that we would return to Elephant Nature Park but that it wouldn't be for 3 days and 2 nights. Instead, we would stay at the park as volunteers for nearly two months. We would learn even more about the elephants at the park. 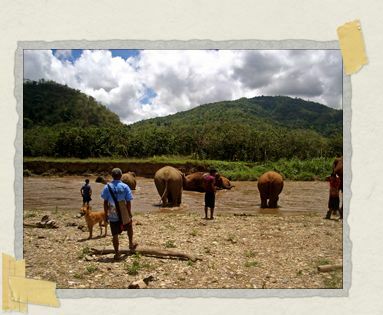 We would learn even more about the plight of the Asian elephant in Thailand. We would grow used to having elephants around our hut during the day and hearing elephants trumpeting occassionally throughout the night. We would become wonderful friends with our guide Jodi, with Karl who is the only western mahout at the park, with his wife Michelle who is the park's primary guide, with dozens of day visitors and other volunteers who would come and go during our time there, and with Lek…beautiful, inspiring Lek, the woman who founded the park and who embodies the notion that just one person can change the world. Most of all, Tim and I would fall in love with the 30 rescued elephants at the park during our 7 weeks there. And our time at the park, without a doubt, would affect us more than anything else on our trip so far. SO COOL! Sounds like an awsome time! awwww…th… is such a great story! It sooo does not surprise me that you went back to volunteer. I can only imagine the sense of amazement when it finally hit you "oh-my-god.. I am bathing an elephant!.. (poop and all)"
I LOVE ELEPHANTS. There were elephants in the circus in Mexico I lived with when I was a kid, and I was always so saddened by the way they were treated. I could see how intelligent and gentle they are just by looking into their eyes… Ever since then they've been quite dear to my heart. you two never cease to amaze me. i can't wait to hear even more. Man do I ever miss you guys.. its so nice to come here and read up and see all the things you get to experience. Still.. you haven't been to Newfoundland so you are missing out..
Timmy and Jessica may have not seen Newfoundland, but they have seen Quebec and Ontario does that count for anything? Did you think you would be so profoundly changed when you made that first step onto the plane from home? Life happens, isn't it wonderful? wow, only you two, true adventurers! What a wonderful opportunity you've had to work with these majestic creatures. Can't wait to hear more. Hey Donnae! Congratulations on your upcoming trip to the Park. You'll love it there! As the post above mentioned, we had fully intended on being there for only a day…and 7 weeks later, voila! All of that is to say: Yup, you may as well just give your notice at work now! LOL!